the fragments that remain: Does God really look that different to you, dear Lahore? Does God really look that different to you, dear Lahore? 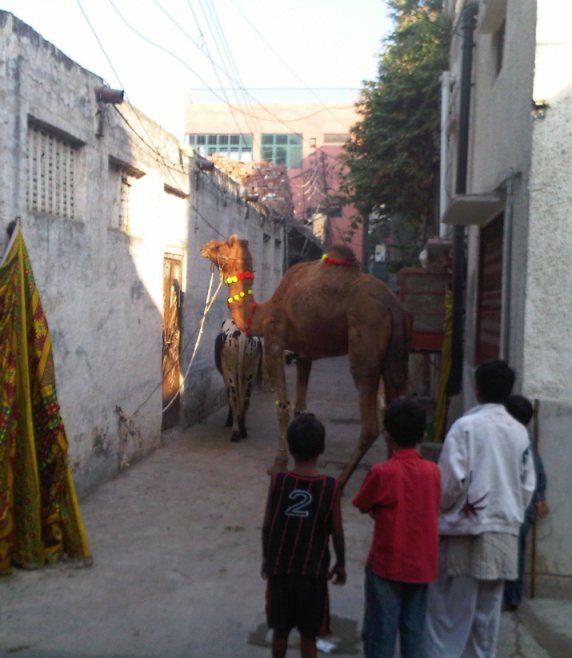 Since I arrived in Pakistan less than a week ago, there’s been one major thing that’s separated Lahore from all the other cities I’ve been: Around every corner, around every intersection, around every driveway, there’s bound to be some type of goat lying on the pavement, a sheep eating straw, or a camel playing with the kids in the alley. Not what you were expecting me to say? Yes, Pakistan is a Muslim country in South Asia, thousands of miles from the US, with a reputation as the most dangerous country in the world. But I’m realizing that it’s not that different, when you dig a little deeper and begin to replace assumptions with questions. Take the animals, for example. After asking a few questions, I learned that they would be slaughtered, shared with family and the marginalized, and eaten in honor of today’s holiday, Eid-ul-Adha. Yes, that still sounded kinda exotic, but then I learned what the holiday represents: a celebration of an event both the Christian and Jewish faith also hold dear, when the obedience and faith of Abraham (Ibrahim) to sacrifice his son on Mt. Moriah was rewarded by a ram substitute that God (Allah) provided. While this has been an interesting revelation, it was actually one that I had been marginally prepped for back in New York. 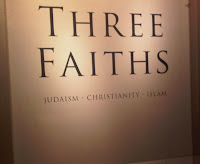 A few weeks ago, the Fellows and I visited the NY Public Library on 5th Ave (one block away from my old job) where they have a special exhibition called “Three Faiths: Judaism, Christianity, Islam.” As we walked from section to section – reviewing scriptures and artifacts from hundreds and thousands of years ago – the underlying theme became clear: The three religions are actually more similar than different. As the NY Times put it: out of many, one. Although we’re all keen to highlight why our religion is better, the reality is that the similarities are alarming. 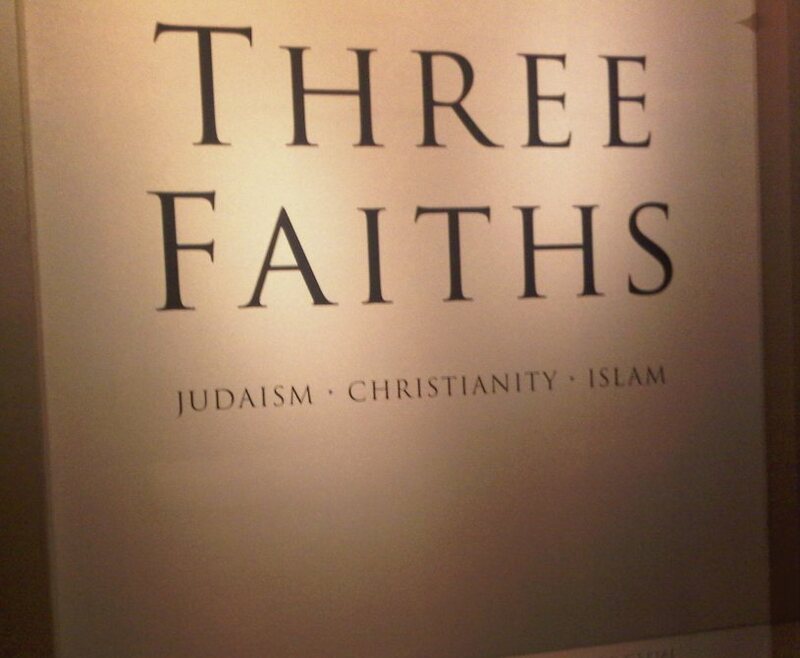 For example, each religion is founded on the idea of monotheism (one God), upholds the importance of Abraham, supports the revelation of God through prophets, and claims those revelations are documented in canonical written texts. In the same way that the media loves to share bad news, I’m realizing that humanity has been increasingly guilty of tirelessly promoting the differences between societies, rather than focusing on how we are similar. Sure, differences are what make us unique, but what makes uniqueness beautiful is the ability to appreciate diversity within the context of our similarities. Alternatively, if we allow these differences to polarize and ostracize communities, diversity becomes a source of tension and degradation instead of the reflection of God’s creativity from which it was inspired. My hope is that I can internalize and develop this appreciation during my 9 months in Pakistan, and especially as we enjoy the Eid festivities during the holiday season. Great post Benje! I am glad to to know that Lahore is treating you. I like the realization that we promote differences rather than similarities. There are so many miss-conception and assumption in the States about Pakistan and the same way in Pakistan about the US. I was amazed to see the way people thing about us in the west in contrast to the way our media and some political forces portray them to our people. I think people to people contact is so important to minimize the 'miss guiding differences' and bridging the hearts, no wonder if it is even on the basis of religion, culture and common human grounds. Thanks so much for the thoughts Zahoor, I think you're exactly right! "People to people contact is so important to minimize the 'miss guiding differences' and bridging the hearts" -- Love that! Bryan and I will be in Karachi the first weekend in Dec, so let's definitely plan to catch up! So great to see this dialogue happening, thank you Benje for sharing your thoughts.. The world can change one interaction at a time.